iOS Compatibility: Requires iOS 9.0 or later. Worldy Cup: Arcade soccer like in no other game on your iPhone, iPad and Apple TV! 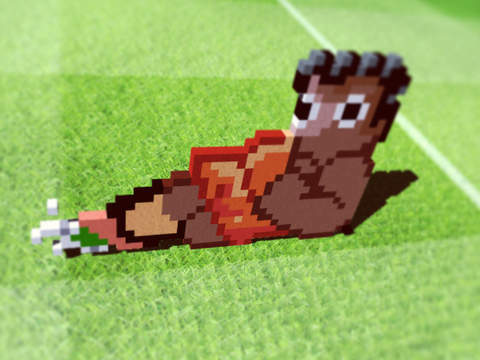 Worldy Cup turns classic arcade action fun sports soccer super fresh and fun with lots of cool gameplay features and a great unique 2D/3D combo visual style. Powerups! Super shots! Unlockable sceneries! Team commands! Super Pixel 3D! Unlock wild soccer field sceneries to play on the moon, mars, an ice field, during a meteor storm and many others. -Download Worldy Cup on the Apple TV and all your iOS devices. keep it pressed to sprint, though it depletes sprint energy as you sprint so in between you should not use it and stand still to recharge it. It also recharges a bit when you collect coins and it recharges fastest when you stand still while having the ball.